At any given time, an ecosystem is swirling with biological interactions, such as species eating one another, competing with each other for resources, or helping each other out for mutual benefit. One of the trickiest things for ecologists today is to predict how environmental and climate change that humans impose on the world could transform these complicated interaction webs. A recent French study gently prods at these questions by investigating how birch trees interact with their neighbors and the insects that feed on them, when water availability in the forest stand changes. Silver birch leaves – spot the insect damage! Photo: Emőke Dénes. be attacked by insects if their neighbors belong to the same species. In other words: in a group of trees that are all the same species, it can be hard to be a good neighbor. The reason for this is pretty straightforward: if a group of insects has managed to locate a suitable tree to feed on, it will be easier for them to spread onwards and multiply if there are more trees of equal suitability nearby. However, the opposite is sometimes also true: a tree can be more susceptible to attack if it has neighbors belonging to another species of tree. The general term for this sort of phenomenon, where the level of insect damage on a focal plant is dependent on the species identities of its neighbors, is associational effects (see figure below for an example). So what is it that determines whether you’re going to be worse or better off when you’ve got your own species next to you? A possible answer is that it’s determined by climatic and environmental factors. If that’s the case, it’s of high interest for future forest management, since our changing climate will likely cause an increased severity of pest outbreaks in forests around the world. Scientists think that the importance of associational effects will change when the climate changes, but this prediction needs to be tested in experiments. Wanting to understand these complex relationships better, a group of French scientists set out to investigate how diversity in the forest stand might influence the pest impact, and how this, in turn, might depend on water availability – an environmental factor likely to change dramatically due to climate change. 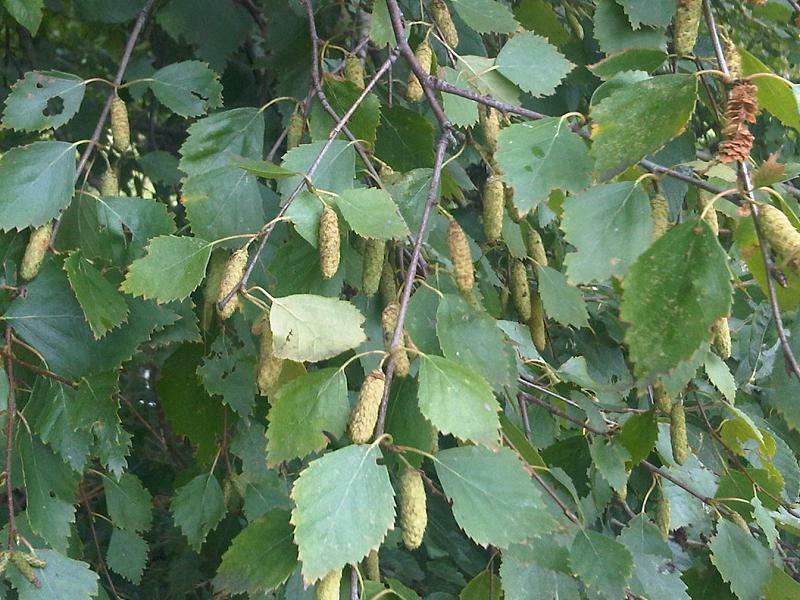 In this figure, the insect damage is higher on a birch when it is grown with other birches, than it is when the birch is grown alongside other species. This illustrates an example of an associational effect (in this case, reduced pest damage for the birch tree when it’s grown in a more diverse stand). The scientists looked at silver birch trees growing in single-species stands and compared their pest levels with birch trees grown in mixtures together with oak and pine. They also compared each of the two forest types at contrasting water availability levels: drought and added irrigation. What they found was that birch trees grown with oak and pine actually exhibited higher damage from pests: in other words, the associational effect here was an increased likelihood of attack for the focal tree. However, this was only the case in trees that were drought-stressed. The authors suggest that this is partly a result of changes in leaf chemistry. Specifically, it seemed that leaves on these birches had higher levels of chemical compounds that the insects find unappetizing, but only when the birches were grown with other birches. These chemical compounds were reduced when other tree species were present. So to sum up: it seemed like drought made the birches better neighbors to one another, but made it harder for other species to give the birches a helping hand when it came to damage control. The strength and direction of associational effects – in other words, whether we would expect increased resistance or increased damage for trees in a more diverse forest stand – is likely to change with a changing climate. This is a key issue when it comes to reliably predicting, and subsequently counteracting, potential increases in pest outbreaks in forests worldwide. But, as always, much is left to be understood about how the different trees help or hinder one another’s damage control efforts, and about how this particular subset of nature’s messy jumble of interacting species will respond to an ever changing climate.